A unique way to increase your grip strength, reduce finger stiffness. This Reverse Grip Trainer is like doing yoga for your hands, helping reverse the inevitable wear and tear due to the repetitive motions of playing guitar. Squeezing exercises shorten the muscles in the palms, limiting your reach which is the last thing a guitar or keyboard player needs to do. The reverse grip trainer exercises the muscles that open your hands while helping your palms and fingers be able to reach further. It also improving grip strength and endurance. The effects of reverse grip training are felt immediately, helping you improve the speed strength and flexibility in your fingers, improving your playing endurance and performance. 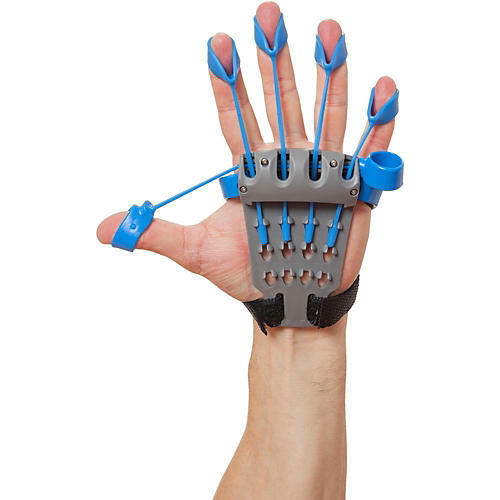 Extend your playing career with help from this one-of-a-kind hand exerciser. Order now!